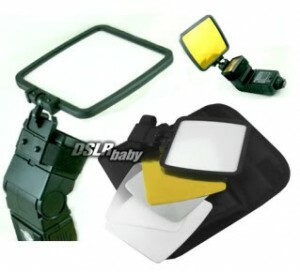 eBay seller dslrbaby has listed a variable-angle flash reflector resembling the Demb Flip-it! Read on for details and a review. eBay seller dslrbaby has listed a variable-angle flash reflector resembling the Demb Flip-it!. A new feature is the use of interchangeable reflector cards, allowing you to choose from gold, silver, white and translucent to get the effect you want. Easy, universal Flex-band mounting to fit most flash units with bounce heads. *For soft indirect flash light use the pure white card. *For soft warmer light use the gold bounce card. *For greater range and spectral highlights use the silver bounce card. *For a direct but soft and pleasing lighting effect,use the translucent filter. It helps to reduce hard background shadows and eliminates the annoying red eye effect. The Ebay flipper does work as a mini bouncer. The Gold is useless, it is as Tim say’s a “…hideous cast of gold…”. Seriously, it’s a brutal amount of warming, that I can’t see being required, unless you are trying to correct against tungsten or something. The Diffuser panel, is a bit of an oddity. It is supposed to go straight in front of your flash and soften the light. Hmm, not really all that effective. It can. however be angled up, which makes for a semi efficient Demb type device, whereby some of the light is going to the ceiling and some is coming straight forward. As I say though, not too efficient. The Silver reflector is way too harsh. The whole reason you buy this is to get soft shadows, and the silver defeats the object. So, this can be modified, and the diffuser panel could be cut down to size to allow some forward diffusion.